Editor's note: A 1935 look at the harvesting needs of the small fanner reveals that little has changed in the past 40 years or more. * Reprinted with permission from Agricultural Engineering, June 1935. The development and widespread use of the combine was retarded for over 75 years because farmers, grain dealers, and farm machinery manufacturers thought it would work successfully only on the Pacific Coast. 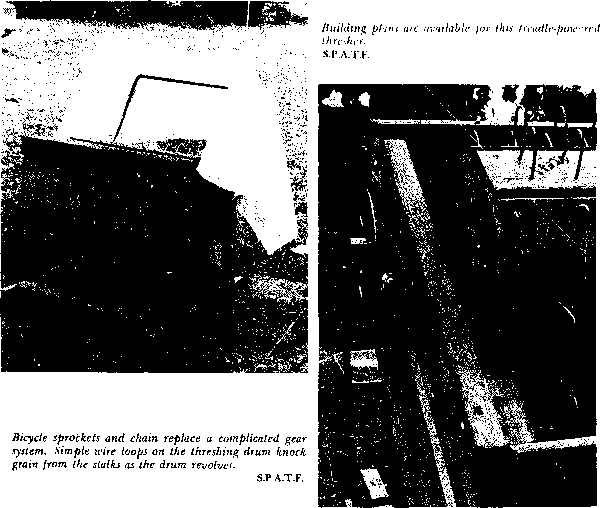 After the practicability of the combine had been demonstrated in the Great Plains states, it was predicted that its use would be restricted to areas where large-scale farming wss practiced in dry areas. The demand for combines, for harvesting soybeans in the corn belt, the intiouuction of the one-man combine, and the windrow harvester again made possible a wider use of this type of equipment. Few, if any, agricultural machines are more efficient in performing the work for which they are intended than combines. However, the cutter bar is designed for heading ripe, dry grain and the cylinder, for threshing such material. In harvesting soybeans in the South, it is necessary to cut the plants within two or three incites of the ground and to handle a large volume of tangled vines and green weeds. In combining rice in the South, it is also necessary for the machine to handle not only green (unmatured) straw and weeds, but also much more straw than is customary in harvesting wheat. The combine is also one of the few machines which may be purchased as well as operated at a lower cost than the equipment which it replaces. It is not, however, sufficiently low in first cost to permit its use on thousands of farms where general-purpose tractors are used. A small, inexpensive combine of somewhat different design ihan those now on the market would, it is believed, be used on many small farms in the east, north central, and some of the middle and south Atlantic states for smalt grain, in the south Atlantic and east south central states for soybeans, alfalfa, and clover, as well as a stationary thresher for cowpeas and other legumes. 10. A flexible mounting—pneumatic rubber tires or springs.